FMC Technologies’ Automated Guided Vehicle System (AGV), available from Robotic Automation , provided a solution to vehicle control issues, which required high precision deliveries, eliminated human exposure to a hostile work environment and reduced labour cost. This application consists of two unit load vehicles with differential drive design. 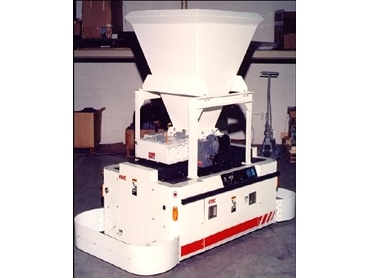 The vehicles are equipped with an onboard hopper to carry and dispense in process granular raw material. The round the clock throughput demands of this facility requires one vehicle to service the process while the second vehicle is charging. The plant controls regular release of the product from a ceiling mounted scale into the on-board AGV hopper. The plant controls interface with the AGVs and instructs the AGV system computer to direct the AGV to 1 of 10 mixers. The mixer feed station is actually a hole in the floor where the vehicle will straddle the opening for material dispensing. The AGV hopper is equipped with a slide gate valve. When in position and on a release signal, the vehicle opens the valve and the raw material feeds into the mixer opening for material dispensing. The valve closes and the vehicle returns to the scale station for reload on a two- minute cycle. If the battery is 80% discharged, the vehicle automatically routed to the battery recharge area, where it automatically swaps position with the newly charged second vehicle, which travels to the scale and assumes delivery functions.